Call it a very costly miscalculation. 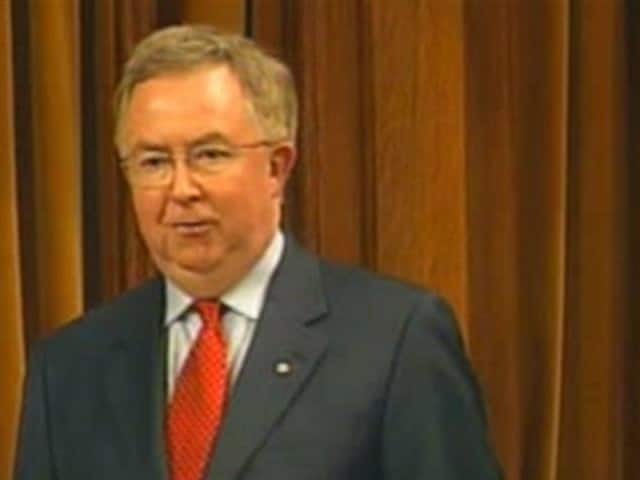 Joe Clark's minority government is facing a vote of confidence in the House of Commons two days after Finance Minister John Crosbie unveils his budget before Parliament. But the Liberals and the NDP aren't having any of it and unite to vote against a government that, they later tell CBC News, has "no credibility." When the votes are tallied, a flurry of flying paper greets the news that the government is defeated on Dec. 13, 1979. The nation is facing tough economic times - high inflation, rising unemployment and a spiralling deficit. Crosbie's belt-tightening budget imposes more taxes on energy and will boost the price of Canadian oil closer to levels in the rest of the world. If he removes a proposed gas tax of 18 cents per gallon, Crosbie could get support for his budget from the House's five Social Credit members. But he refuses, and the five members abstain from voting. The numbers just don't add up in Joe Clark's favour. With three Tories of 136 out of the House (in hospital and overseas) and five Social Credit abstentions, Clark is up against 112 Liberals and all 27 NDP members. His government is brought down, 139-133. Not seven months after he became prime minister, Clark will be hitting the hustings once more after he sees the Governor General to dissolve Parliament. • "The caucus supports the view that we should give the government a chance to govern," Liberal Leader Pierre Trudeau said before Parliament opened in October 1979. But, Trudeau added, his support had its limits: he would oppose any attempt to take apart Petro-Canada, the state-owned oil company his government founded in 1975. • Though Clark's government was elected in May 1979, Parliament didn't begin sitting until October that year - the longest such period since Confederation. • Reforming Parliament was the focus of the 1979 speech from the throne. Clark's government vowed to shrink the government and to improve federal-provincial relations. Among the other priorities the government set out were new freedom-of-information legislation and tax credits for property tax and mortgage interest. • The speech made no mention of Quebec, which was soon to vote on a referendum on its future in Canada. Nor did it speak of Canada's foreign relations. • In introducing his budget to Parliament, Finance Minister John Crosbie said: "One of the main reasons Canadians elected a new government last spring was to set a new and realistic course for this country. This, I and my colleagues are determined to do, even if it means risking some unpopularity, hopefully short-term. We are committed to the proposition that in the longer run, good economics is good sense and thus good politics." • From the moment the budget was introduced in the Commons on Dec. 11, 1979, the Liberals and the NDP both vowed to vote against it. • "It is the budget that stole Christmas," said Robert (Bob) Rae, then finance critic for the federal NDP. • Rae made the confidence motion on Dec. 13 that resulted in Clark's defeat. The motion attacked the proposed budget and what it said was a record of broken promises. • Clark's government faced confidence votes at least three times previously in Parliament, but had prevailed. When the issue was Petro-Canada, too few Liberals turned out to vote; another time, on a motion related to energy policy, the Social Credit members supported the government. • "The opposition parties have decided to disrupt the nation's business," Clark told a press conference after the non-confidence vote. • Clark visited Governor General Ed Schreyer the following morning to request that Parliament be dissolved. Schreyer asked whether Clark was willing to stand in as head of a caretaker government for two or three months in order to avoid a winter election. Clark refused, so an election was set for Feb. 18, 1980. • "We're having an election... because we've had a prime minister for the last seven months who hasn't listened to the people of Canada," NDP leader Ed Broadbent told the Globe and Mail. • Another minority government was not elected in Canada until 2004 with Paul Martin's Liberals. In November 2005 that government also fell in a vote of non-confidence. • 1883: The border is established between Ontario and Manitoba. • 1979: Joe Clark's minority Conservative government is defeated by six votes. Clark had been prime minister since June. • 1994: Ontario becomes the first province to allow nurse practitioners to diagnose common illnesses and prescribe certan drugs without a doctor's supervision.